We are your professional equipment supplier for international conferences in Germany and the whole of Europe, with 30 years of experience in this sector. Since 1978, Ellerbrock Konferenztechnik has been a leading supplier of conference equipment, interpretation equipment, tour-guide sets for small-group interpretation, electronic voting systems and discussion systems. Take a closer look at our product range on our website. The following summary gives an impression of the different types of equipment. This term stands for all the technical equipment required for simultaneous interpreting. Interpretation equipment includes modern interpretation booths equipped with consoles (desks), microphones, headsets etc for the interpreters who are seated there. Further essentials are microphones and audio equipment in the hall for receiving the spoken interpretation and picking up the original spoken word for transmission to the interpreters. We are your professional partners for rental of TED (tele-dialogue) systems, i.e. voting systems for conferences, quiz shows and other events. These wireless tour-guide sets were designed for professional guided tours in factories, where there is a certain amount of background noise or the guide is not clearly audible to all group. 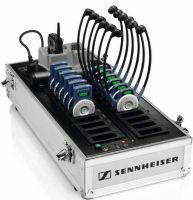 We supply three different types of professional tour-guide set manufactured by Sennheiser. You can hire this equipment through our rental service. They can also be used for interpreting on-site visits or for whispered interpretation in small-scale settings.